Lots of people play flash and casual games every day. Each day hundreds of new games are published on thousands of gaming sites worldwide. Where to play the best ones? The reality is that 90% of casual games are not worth playing. It is true that everyone has different tastes but more than 90 % of these new creations represent a copy of a popular game, already created by someone else. This is why I decided to compile a list of 15 best casual genuine games. Many people think that a good game needs to be fancy, e.g. great design, nice features, etc. But it is not true. A student from Eastern Europe needed money to pay for his studies and he created a flash game called Bubble Struggle (sometimes known under the name of Bubble Trouble, which is actually the first game of this series). This game is not fancy at all - plain design and no story. But it is funny and entertaining (and also has 50 levels, so it takes quite a bit of time to complete it). What makes this game difficult to play is the fact that the hero cannot jump over the balls. In fact he is stuck to the ground and may only move left or right. 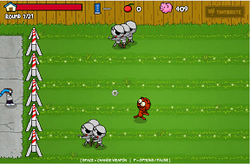 Snail Bob is a popular game series (two instalments have been released so far). The players are to help Bob get back home (or to his grandfather's home in the second instalment). It is not so easy as the snail has to deal with many obstacles, such as traps, electric cables, spikes or evil snails. Both games feature great design and lots of entertainment. If you like strategy games you will love Battle Beavers. The story begins in the Land of Beavers. Those peaceful and hardworking creatures were attacked by an evil Beaver Magician who enslaved them. Luckily there is one hero (you) to free his friends and kill the Magician. Kill enemy beavers, improve your stats and buy new weapons and armor after completion of each level. If you like zombie games, you should definitely check out Dead Zed. Your task is easy - just survive 40 days (nights) before the army comes to save you. Every night zombies come out of their graves and will be trying to kill you. Destroy them before they penetrate your house and bite you. This game features a very special way of zombie killing. You will be able to purchase a car and use it to roll over zombies. The further you go the more money you will earn and the better upgrades you will be able to get. In this game you will have to go over obstacles. Use items made available to you to fill the holes and bridge the gaps so that your car journey is safe. You can also use magic but only after completing level 10. If you like flying a paper airplane, check out this game. Your task is to make your paper plane fly as far as possible. Earn money to buy new upgrades and add extra power to your plane. Can you break the record? Bob really loves money. Help him collect all the money using items made available to you. This is a great physics game for both children and adults. If you like match 3 games, you should certainly check out this one. It has a great story and many special features, such as multiplayer mode and many different species of sea food and plants. Unlike many other connect three games, this one comes with no cost and can be played for free. If you like riding a motorbike, try out this great game. You will be driving your bike in a desert. Try to reach the finish line as fast as possible without having an accident. If you like Atomic Bomberman games, check out this great clone. Your task is to get to the other end of the maze by killing all zombies and undead creatures. Plant bombs and kill the bad guys before they get you. How far can a zombie fly? Check out this game to see. Your task is to launch the zombie and make it fly as far as possible. Try to collect items, which increase your speed and avoid items which slow you down. When one plays baseball he or she normally wants to score points without damaging any buildings, cars or members of the audience. In this game you will only earn points for window breaking, dustbin smashing or vehicle destruction (except the police vehicle).Can you score enough points to advance to the next level? This game is certainly one of the best difference games I have ever seen. It features scary pictures and a great story. Search for differences between each pair of pictures and learn how the story ends by finding them all. Escape games are very popular. Your task is to escape from a Dragon Tomb by finding all the clues. If you get stuck use hints to get help. Experienced gamers completed this game in 15 minutes. How long will you take? What is your favorite casual game site? Nice list of games. I would also add a game called Cover Orange to your list. It is a great game featuring protection of oranges and apples agains deathly rain. Why Do People Turn To Games Like Second Life? Zynga Falls - Could it be due to lack of Creativity? Every programmer fears one thing - Copycats! As per the latest financial reports and stats Zynga has lost out a lot - could it be because they're copying others?